Having spent much of February in the Scottish Highlands, it was logical to choose an image from that trip for February's IOTM. 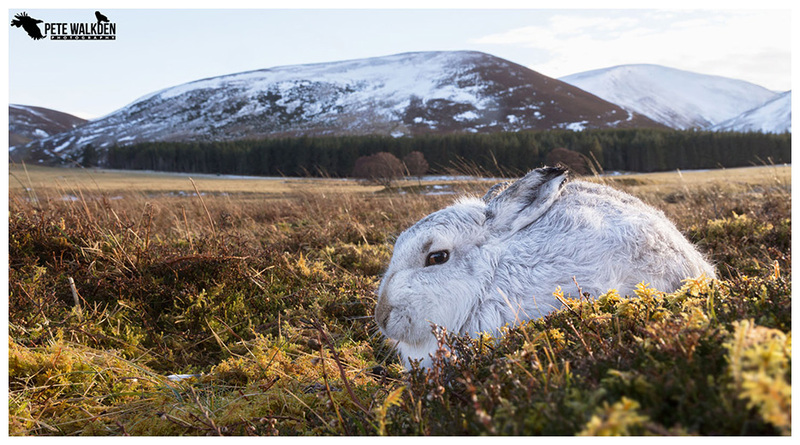 Prior to taking clients out on the hills to photograph the mountain hares, I took a trip out to the site with friend Andy Howard, to catch up with the hardy creatures, and get "insider info" on the best hares to look for - basically those that generally sit for photographs. Andy visits frequently, so is always aware of the best hares to approach. However, before we had left the parking area, we encountered a mountain hare, and it didn't seem to be bothered by us whatsoever. Initially we approached as normal, but it soon became clear that the hare was at ease with us being close by, and we turned our attentions away from the usual telephoto lenses, and dug out a wider option, my Canon 24-105mm. Crawling forward on our stomachs, we got so close to the hare, it was within reach of petting (we didn't in case it upset the creature or worse, bit us!) but from such a proximity, we were able to get some of the surrounding scenery in the image, as well as keeping the hare looking large in the frame. It is most definitely the closest I have been (intentially) to a hare, and the first wide angle images I have obtained. The hare continued to graze as we photographed it, eventually ambling off, away from where we lay, and then off down an embankment. A remarkable encounter, and one that will live in memory forever.